Windows Live Essentials comprises a bundle of Microsoft software applications for Windows operating system to complement the OS which lacks many basic features by default, especially before Windows 8 / 8.1 / 10 era, probably due to antitrust concern. Windows Live Essentials software bundle proves to be very popular with Windows users. Even though most of the software was no longer actively developed since 2012, and was since discontinued by Microsoft on January 11 2017, some apps may still be useful and are good quality free alternative to paid commercial apps. For example, Windows Movie Maker is still a good basic video editing software, likewise for Windows Live Photo Gallery. In some cases, you may need to reinstall Windows Live Mail to recover or retrieve the thousands of emails that were downloaded to Windows Live Mail, and the program can also act as important intermediary for importing and exporting emails into Microsoft Outlook and other email clients. 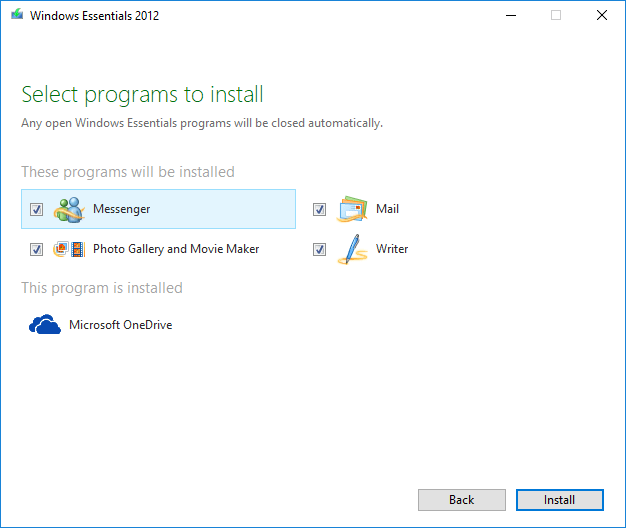 Of all the apps available for install, Windows Live Messenger is no longer usable as it’s superseded by Skype. Microsoft OneDrive is now built-in natively in Windows 10, and even if it’s not, newer version of OneDrive client should available for download online. The download should start automatically. To install all or any programs of Windows Live Essentials bundle, run wlsetup-all.exe, and select “Install all of Windows Essentials (recommended)” or “Choose the programs you want to install” and then select which applications you want to install. Once installed, the applications will continue to work for a foreseeable future.